On your initial visit, we assess your pet to create a customised plan for exercise. Our initial evaluation involves collaborating with the primary care Veterinarian and you, the pet owner to set goals which can be reached quickly and safely. A veterinary referral is necessary for us to have a full understanding of your dog's health history before beginning any exercise program. 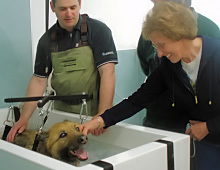 K9 Hydrotherapy offers a range of treatment programs, each having been designed to cater for a specific area of need. In their application, programs are also tailored to the requirements of each individual dog and are constantly changed and adapted as the dog progressing through the course of treatment to optimise response and recovery. All programs start with an initial assessment session which lasts up to an hour. 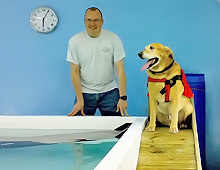 Each further session in the hydrotherapy pool depends on the condition your pet suffers from and its progress - in the early stages your dog may only swim for a short period until fitness improves. Additional time for the use of the wash down and drying facilities is also included. Dog Grooming, training, massage and additional treatments are available at an extra cost and can be arranged to complete your visit with us. Collection & delivery service is available through our "Bark & Ride" service.